Dear Readers, now that it’s the middle of November it’s becoming harder and harder to find plants that are not only still in flower, but are new to the Wednesday Weed. 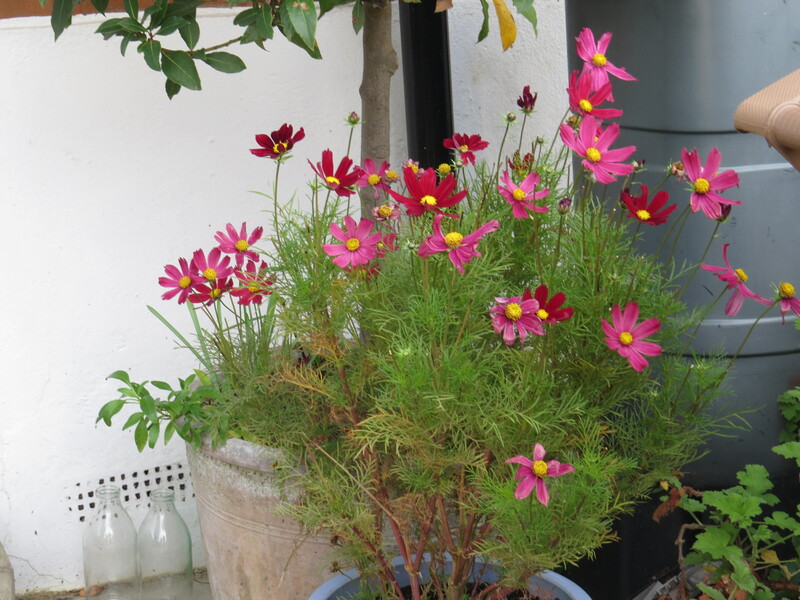 So this week I was delighted to find a pot of cosmos still in flower. These are great late-autumn plants, beloved by pollinators (if there are any about), and they come in a delightful array of pink, white and cerise. The delicate pale green foliage is also very fresh and toothsome-looking. 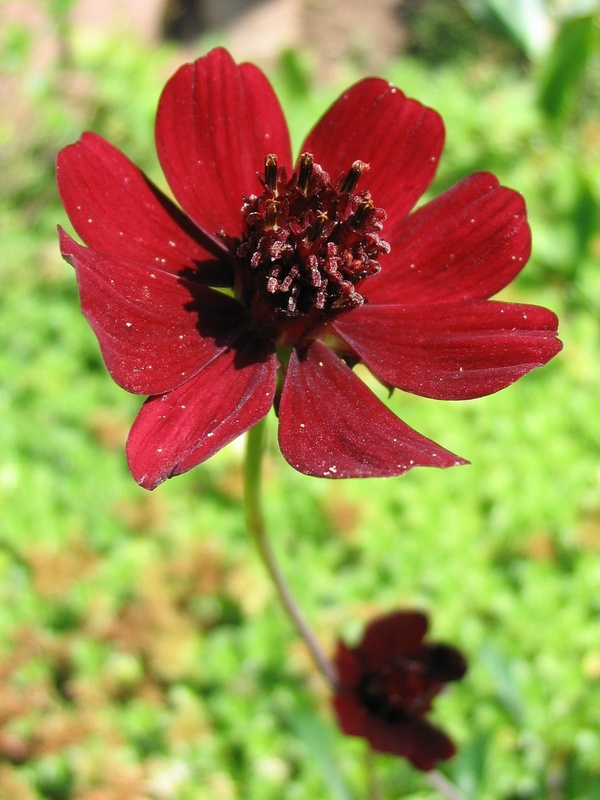 Cosmos is a genus of plants in the daisy family and includes such delights as chocolate cosmos (Cosmos atrosanguineus), which is said to smell vaguely of cocoa, and which has dark reddish-brown flowers. ‘Our’ cosmos, Cosmos bipinnatus, is a half-hardy annual. It self-seeds, and the flowers may come up for several years, though in my experience they get smaller and smaller with each iteration. . It comes originally from Mexico, hence its alternative name of Mexican aster, and arrived in Europe at the end of the eighteenth century. In some parts of the world (such as Australia and Asia) it has become an invasive weed, but in Europe the temperatures are too cold in winter for the plant to get a proper foothold. Cosmos is a floppy kind of plant, prone to keeling over in high winds and not getting up again. Growing a lot of the plant in one place helps a bit, as the leaves interlock and form something of a framework for support. It can look very impressive en masse, and is a popular cut flower. 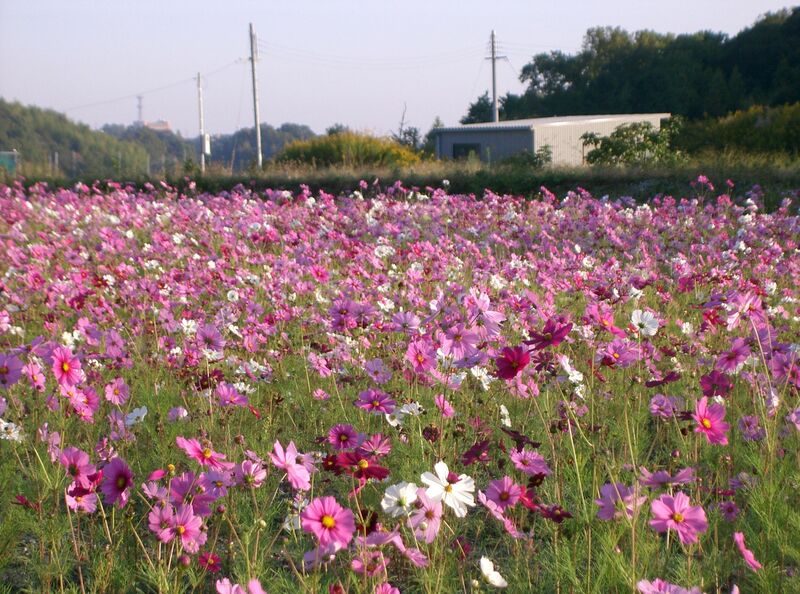 In Japan, the rice paddies are sometimes planted with cosmos to provide autumn colour for after the crop is harvested. The plant is a great source of late-season nectar. 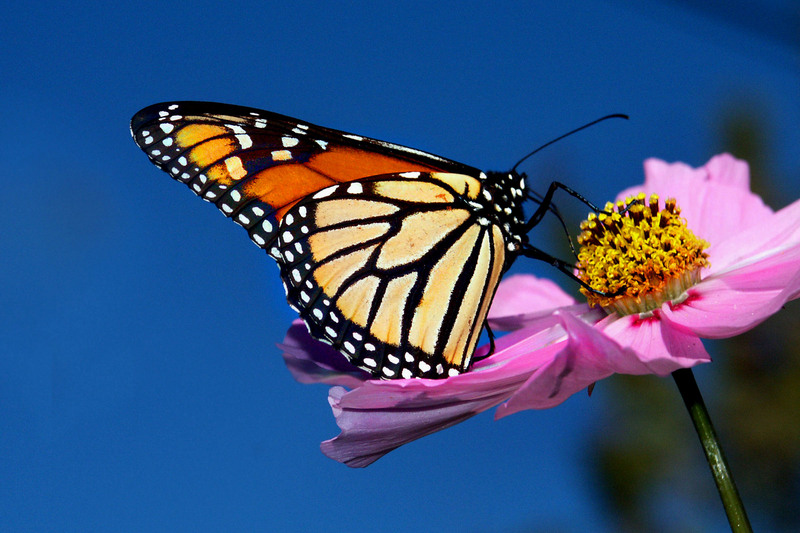 In North America, migrating monarch butterflies use it as a refuelling stop on their way south. In Europe it provides nectar and pollen for many insects, including this comma butterfly. 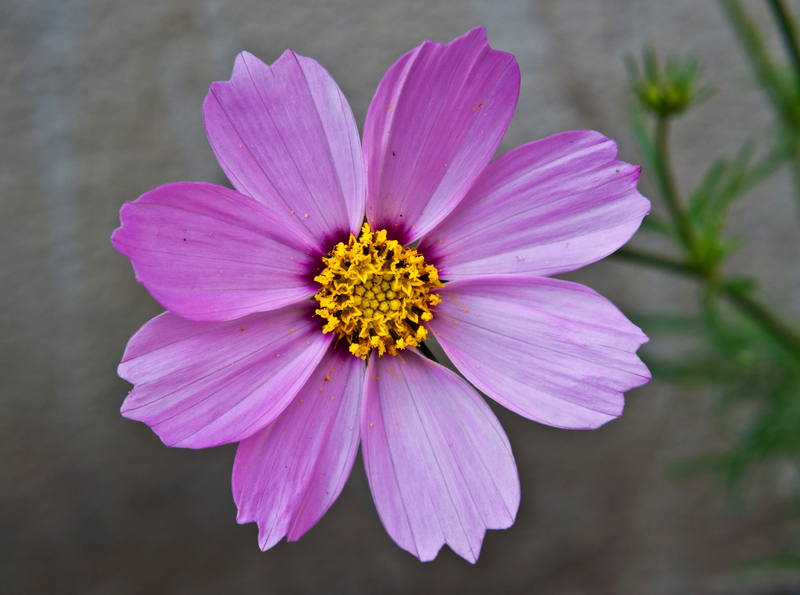 In Central and South America, cosmos has been used to make an anti-inflammatory ointment, and the young leaves are eaten as a salad and as a pot herb. The petals can also be used to brighten up a dessert. A closely related species, Cosmos sulphureus, has been used to produce yellow and orange dye. In the language of flowers cosmos is said to symbolise innocence, and I imagine that the white-flowered variety is especially appealing in this regard. It is said that cosmos was cultivated in the gardens of Spanish mission priests in Mexico, as a manifestation of divine order. 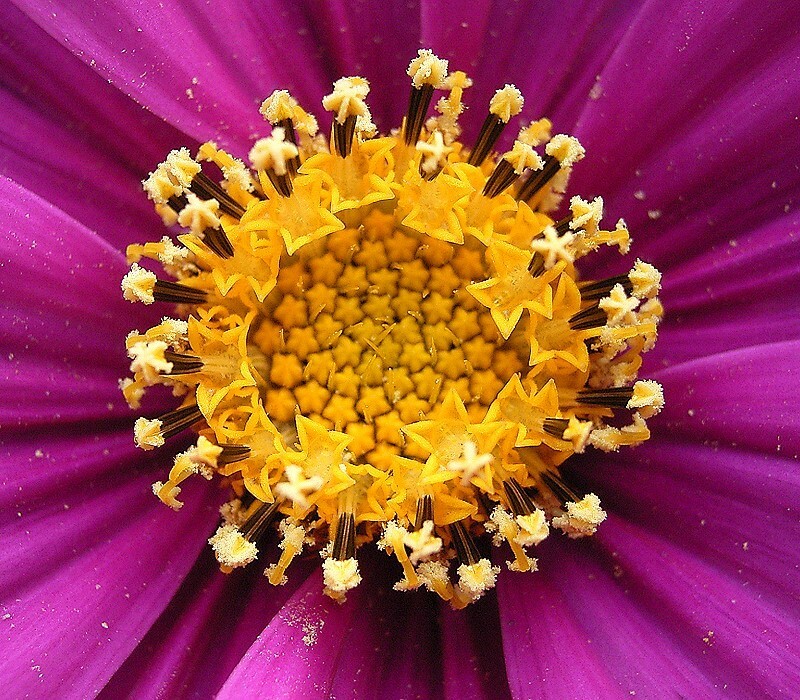 Certainly, a close look at the flowerhead is an object lesson in geometry. There is a kind of harmony about it that reminds me of the cosmos, in the sense of the galaxy. after the bee is gone. I think that it captures that moment just after something has happened, when equilibrium is yet to be re-established. There is such a sense of stillness about it. And it captures the delicacy of cosmos, which can seem such a brash, cheerful plant, and which yet has a subtle elegance. I am thinking that next year I will definitely plant a pot! This entry was posted in London Plants on November 21, 2018 by Bug Woman. I had a plot full of them some years back, they seemed to last for a very long time. They do gladden the heart when seen en masse. I know that it France they are used for Corporate planting and to infill some fields, they look spectacular. Love that little poem; so delicate. Our cosmos arrived in one of those cheap meadow wildflower seed mixes in a can from a big box store. 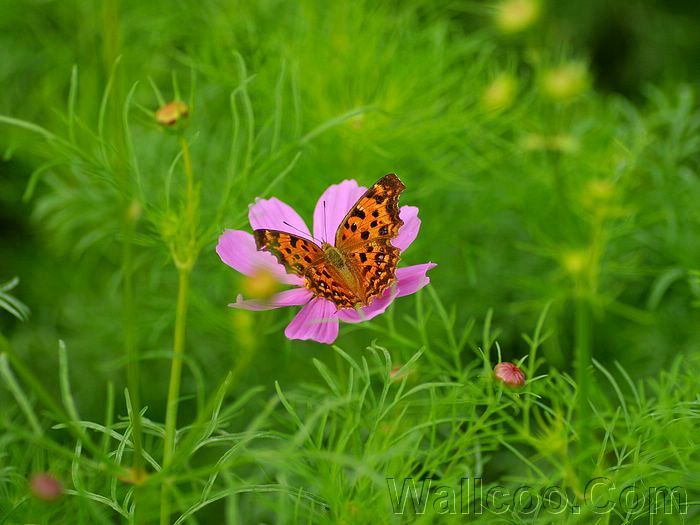 The wildflowers were very nice the first year, but cosmos with only a few others regenerated the following year. All the other seed died out by the third year, but the cosmos seemed like it was going to become an invasive weed. It slowly fizzled out, and is now gone. It was actually pretty cool while it lasted.